Marvel Two-in-One #50: Remembrance of Things Past! Ben and Reed (Mr. Fantastic) are in the lab at the Baxter Building, where once again Reed is trying to cure Ben. Once again he fails, this time with a twist. It seems Ben's system is adapting and evolving over time, and though Reed has a cure, it would only have worked back when Ben first became the Thing. It wouldn't work now. Reed leaves, and Ben suddenly has an idea- since it would have worked earlier, why not drink it earlier? Ben hops into Dr. Doom's time machine, sets the controls for not long after the F.F. formed, and heads back in time, intending to have the earlier version of himself take the cure. He ends up in an empty Baxter Building, and slips out just as an earlier Reed and a realtor enter the building to have a look arouns. Page 27, as our Ben finally fells the earlier Thing: "It's Clobberin' Time, ugly! An' you lose!" No Petunia in this issue. 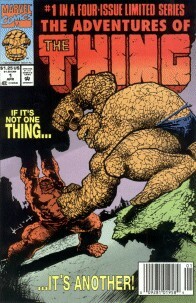 This issue was reprinted in 1992 in Adventures of the Thing #1, part of a four isue miniseries of MTIO reprints. It was also reprinted in 1995 in Marvel Super-Heroes Megazine #5, and in the May 2005 hardcover titled Best of the Fantastic Four Vol. 1. Marvel Two-in-One 100, the final issue of the series, follows up on the situation Ben left the earlier Thing in at the end of this issue. In 2010, this, together with issue #100, was voted as number 7 / 6 in the "Greatest Thing (Ben Grimm) Stories Ever Told!" poll at Comic Book Resources. I like the text on the construction sign on page 17: "Coming Soon on this RM Site- Another soulless glass and steel monstrosity with absolutely no architectual merit. Courtesy of Rand/Meachum." Someone else's review of this issue can be found at http://4colorreview.com/rewind_reviews/marvel_2_in_1_50/marvel_2_in_1_50.shtml, and another review is at http://bullyscomics.blogspot.com/2007/04/ben-grimm-totally-rocks-15friday-night.html. Forwarded by Marvel Two-in-One 76 Guy, as forwarded to him by artist extraordinaire Kirk Jarvinen (quick side story: I met Kirk at the 2007 Seattle Emerald City Comicon and bought a print of a commission he did for MTIO 76 Guy - Kirk was a class act and I recommend him if you're thinking commission yourself! ): the image to the right comes from the semi-classic Bill Murray movie Meatballs. Any guesses as to what comic this comes from?? ?.